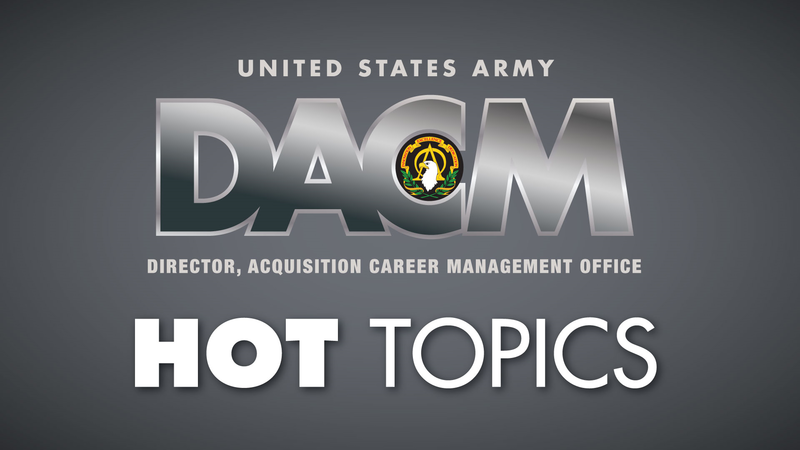 Hot Topics is a monthly breakdown of current news, important dates and updates affecting the Army Acquisition Workforce (AAW) in the next 30 to 60 days. 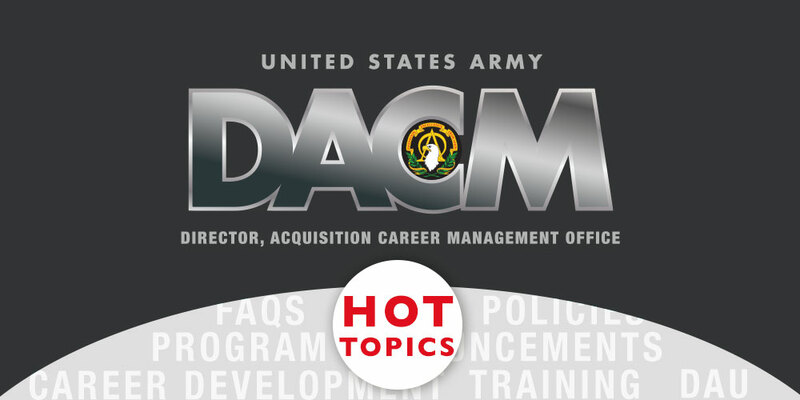 Look for a new edition the first Tuesday of every month from the Office of the Army Director for Acquisition Career Management (DACM). As a reminder, the Senior Rater Potential Evaluation policy took effect just over a month ago. This policy affects the entire Army Acquisition Workforce (AAW), starting with those at the GS-14 level. Read the policy, FAQs and other materials to learn more about this annual mandate now in effect. The FY17 Centralized Selection List Acquisition Key Billet Project Manager and Acquisition Director Board application window for colonels and GS-15 AAW professionals closes November 20. The Acquisition Leader Challenge Program nomination window opens on November 3 for second quarter classes. Learn more about the program and how to be nominated. FY16 Product Director Centralized Selection Board opened October 26 and closes December 17. FY17 Winter MAPL Review Board is January 25-29, 2016. The Competitive Development Group/Army Acquisition Fellows Program announcement window opens December 2 and closes on Feb. 4, 2016. The Defense Acquisition University – Senior Service College Fellowship announcement window opens December 2 and closes March 9, 2016. Interested in learning more about cybersecurity? Register for the highly recommended distance-learning course CLE 074: Cybersecurity Throughout DOD Acquisition. The course provides a foundational understanding of basic principles of cybersecurity and cybersecurity risk management in the defense acquisition field.